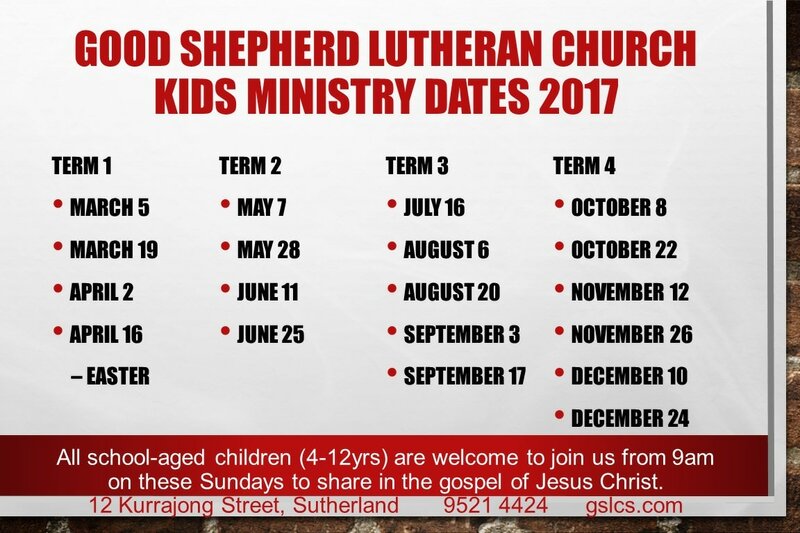 Our children's ministry program is held on the 1st and 3rd Sundays of each Month during School Terms 1 and 3, and the 2nd and 4th Sunday's of each month during School terms 2 and 4 (except in May where it is held on the 1st and 4th - see list of dates below), and caters for both Primary- and Pre-Primary-aged children. We are blessed to have John as our Children's Ministry Coordinator, and for more information about our Children's Ministry please contact John via kidsministry@gslcs.com or Pastor Mat via pastor@gslcs.com. You may also like to visit the SonSeekers website or Lutheran Media's Happyland website for additional information and fun activities. At Good Shepherd Sutherland our Children's Ministry programme is based on the 'Faith Inkubators' BibleSong Materials. This programme aims to help children grow in their relationship with Jesus, and link the teaching of faith from 'Sunday School' to the home and family.